In the modern marketplace, as the weight of climbing helmets has gone down, prices seem to have sky rocketed. Enter the Mammut Wall Rider, an ultra-light, stylish and affordable climbing helmet that bucks the trend and gives the competition something to think about. The Petzl Sirocco, the lightest climbing helmet available (150g), made of unlined expanded polypropylene (EPP). The Mammut Wall Rider borrows the best of all three designs offering a hybrid design comprising built from EPP (the stuff they use in car bumpers), which gives added protection from side impacts, with a hard plastic top for added protection from falling rocks, ice, etc. This unique hybrid construction, in our opinion, makes the Wall Rider one of the best all-round helmets on the market today, offering the latest technologies in helmet design in a neat, stylish and very competitively priced package. Multiple large vents at the sides and rear to keep the air flowing on hot days. The Wall Rider is a unisex helmet and comes in 2 sizes so equally accommodates large or small heads, with or without a hat underneath. The fit is also notably low profile in comparison to similar helmets such as the Black Diamond Vector. 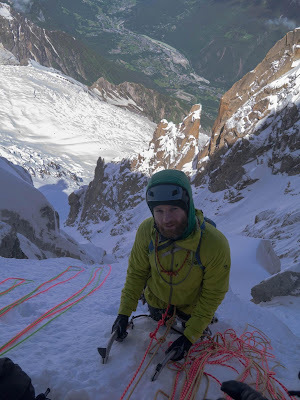 The fit is useful for slipping a hood over the helmet in winter and, of course, stops you looking like a light bulb (see the Petzl Sirocco if that’s your thing). Colours presently on offer include a fairly subdued blue (pictured) or a more vibrant orange, although the EPP sides are always black. As mentioned, the Wall Rider is firmly within the ultra-light call of helmets weighing in at only 195g, making it amongst the lightest helmets on the market today – which is particularly impressive in light of the apparent lack of compromise on durability or features. 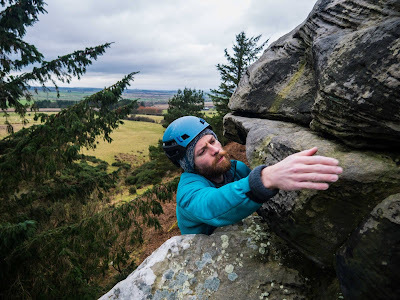 Only the Petzl Sirocco (150g), Black Diamond Vapor (186g) and, the new, Grivel Stealth (190g) beat the Wall Rider on weight but, in our opinion, not without some compromises. In particular, there is anecdotal evidence to suggest the BD Vapor has proven prone to acquiring a few dents from rough packing / general use and abuse, although whether this is purely cosmetic or more remains to be seen. By comparison, after almost a year of frequent use, the Wall Rider looks unscathed short of some cosmetic scratches on the hard shell top to prove it’s doing its job. In any event, the Wall Rider beats of the mentioned helmets in one category which will be of interest to most, price. It retails at £75 but can be readily found on sale closer to £65. That’s nearly half the price of, arguably, its closest competitor, the BD Vapor (retailing at £120). All in, we really loved the Mammut Wall Rider and we think you would too. However, if the fit or the colours aren’t for you look out for the new Petzl Sirocco coming out soon which looks to be incorporating a similar hybrid design as seen on the Wall Rider. The low-profile Mammut Wall Rider on test on Aiguille du Midi, North Face. Things we like: Innovative design; low-profile fit; ultra-light weight; robust; value for money. Things we don’t like: Rear straps can loosen during use; nothing much.